If there's a global real estate downturn, it isn't visible in Monaco, home of the super-rich. Since the beginning of 2006, prices have risen by an average of 51% during the 30 months to June 2008, according to Global Property Guide research. Before this latest spurt, Monaco's property prices had risen by over 10% a year during the previous decade. The British have returned to Monaco in numbers not seen for a long time, elbowing out the Russians, who till recently were the top buyers. The Monaco authorities, pushed by the war on terror and increased international co-ordination on money laundering, have tightened controls. The fund of the new wave of British buyers' funds are more likely to be legitimately earned. Among the Brits there is a mix of City money, e-commerce money, and business retirees. Some British buyers run their businesses from Monaco, taking advantage of the tax free environment. Monaco's prime residential real estate market is in Monte Carlo, which is famous for its Place Du Casino. The most prestigious area is the Carre D'Or" (Square of Gold) around the Place Du Casino. Prices drop by between ten and fifteen percent as one heads east or west of this point. Fontveille, an economical and industrial district, has a supplementary discount due to its less noble access, although the fact that the environment is constantly evolving assures a similar evolution in perceived values. Acquiring property in Monaco is quite straightforward. There are no restrictions on foreigners purchasing real estate. Rental Income: There is no tax on personal income, except for French nationals who must pay taxes to the French government. Capital Gains: There is no capital gains tax, except for French nationals. Inheritance: There is no inheritance tax on direct heirs and spouses. Residents: The Monegasque tax system applies to all residents, regardless of their nationality, except for French nationals. Total roundtrip transaction costs, i.e., the total cost of buying and selling a property, are high relative to the rest of Europe, and are typically between 15.57% and 19.57%. This includes the 8% real estate agents' fee (plus 19.60% VAT), 5% of which is paid by the seller and 3% by the buyer. Another significant cost is the 4.5% real estate transfer tax. Costs for new properties are much higher because 19.60% VAT is imposed in lieu of transfer tax. Monaco’s landlord and tenant relations are pro-landlord. Rent: Rents are set by free agreement between the parties. Any increases must be specified in the contract by reference to a cost of construction index applying on each anniversary. Tenant Security: The legal system works well, not least because tenants' rights are limited. The Principality of Monaco (Monegasque) is the second-smallest independent state in the world, behind the Vatican City. The country - a constitutional monarchy - is surrounded on three sides by France. It occupies less than two square kilometers (0.75 sq mile), much smaller than an average city. Known for its temperate climate, glamorous casino and zero percent income tax, it is a playground for the tourists and a haven for the wealthy. Thanks to the late Prince Rainier III, the principality has become a dynamic economic center with unemployment almost nonexistent. There are more than 100 industrial enterprises which employ 39,000 people in a population of 30,000 Monegasque residents. GDP per capita in 2000 is estimated to be around US$27,000. This economic activity generates an annual turnover of 9 billion Euros according to the government. Taxes on industry, trade, services, hotels and real-estate contribute to a big chunk of The Principality’s revenues, a far cry from the old practice of relying mostly on revenues generated from its famous casino. 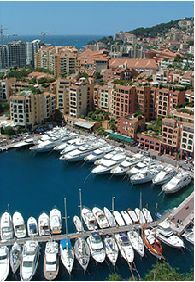 Monaco has very limited supply of property, thus real estate has among the highest square meter values in the world. Aside from its tax advantages, Monaco attracts many foreigners because of the high level of security, cleanliness, cultural events, mild climate and political stability.